Princess Efrddyl was the daughter of King Peibio Clafrog of Ergyng. She was a beautiful young girl much given to the attentions of the young men at court. Having been neglected by her father while he rode out on his military campaigns, she soon found herself seduced by some young buck and, unfortunately, fell pregnant. Upon her father's return, the King was sent out of his mind with fury and threw the poor girl into a sack which he cast into the River Wye. Miraculously, Efrddyl floated and returned safely each time to the riverbank. Peibio then tried to burn her on a funerary pyre at Madley, in Herefordshire. 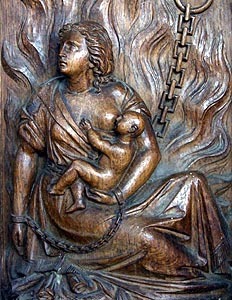 However, his daughter defied the flames and gave birth to a baby boy amongst the ashes. The child quickly melted his grandfather's heart and the two were welcomed back to Court. Efrddyl's son, St. Dyfrig, was later given the area round Madley from which to preach Christianity to the people of Ergyng. It was named Ynys Efrddyl after his mother. The lady appears to have helped her son in his work and founded churches at Llanebrdil (Ergyng) and Llanerthyl (Gwent). She probably lived out her life in seclusion at Llangynfyl (Ergyng) where she had her well, the Ffynnon Emrdil.